Sprinter Leon Reid has been cleared to run for Ireland in the European Athletics Championships in Berlin next week. Athletics Ireland had provisionally selected the English-born athlete, whose mother hails from Belfast, but there was some doubt as to whether he would fulfil the criteria for international transfers in time for the Championships, which include 75% residency and having requested a transfer three years previously. 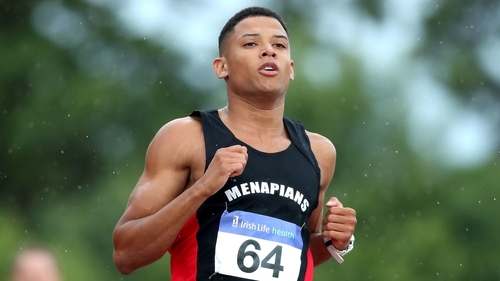 However, the IAAF Nationality Review Panel have confirmed that Menapians athlete Reid is now eligible to represent Ireland in national representative competitions, with immediate effect. Irish double national champion Reid will now compete in the 100m and 200m in Berlin, heats of which begin on Monday and Wednesday respectively. There is the possibility of Reid being added to the 4x400m squad, something which excites the athlete. "I ran a 46.6 split last year with tired legs," he told RTÉ Sport. "On a big international stage wearing an Ireland singlet, I’d definitely be going a lot faster than that. "If I get added to the team, I’ll definitely be giving it my all on the Berlin track."